Adult class format varies depending upon the nature of the class. 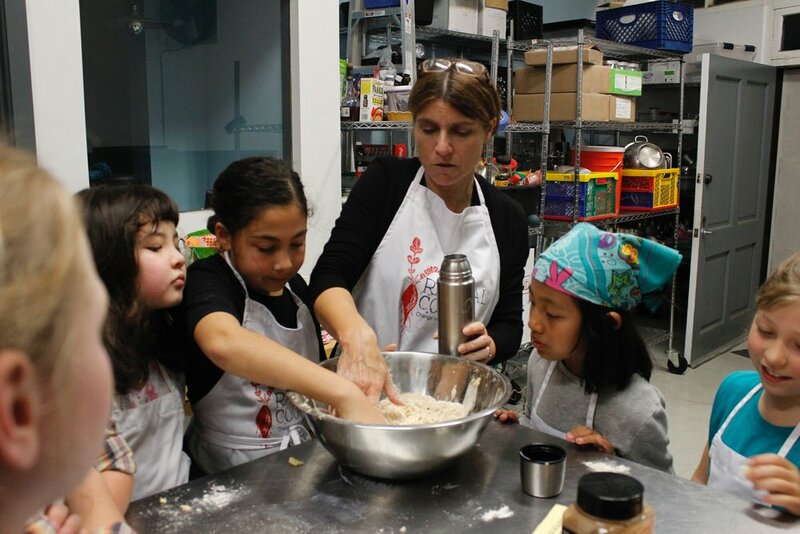 Some cooking classes focus on technique (for example, pasta-making or Soup n' Sides) while others focus on flavors and philosophies or history (for example, Seasonal Eats Seasonal Harmony, Taste of California, etc.). Feel free to call or email us if you have questions or would like to focus on a particular culinary practice. Children's classes vary by topic covered and are designed for children (and sometimes by children!) with the intent to expand culinary horizons and to introduce simple cooking techniques, such as slicing, dicing, mixing, etc. Can you make classes Vegetarian or vegan? All of our adult and children's classes are vegetarian, unless specified otherwise. For example, the bone broth class is obviously not vegetarian or vegan. If you contact us in a timely manner, 48 hours notice please, we can usually alter our recipes for vegan diets or gluten-free allergies. We make every effort to accommodate food allergies or aversions and will adjust menus if possible. Radical Cooks cannot guarantee facilities are nut-free. If you have a severe nut allergy please contact us before registering for a class. You may cancel your registration for a class up to 48 hours in advance of the class start time and receive a full refund or transfer to another class of equal value. To cancel a registration, contact us at radicalradishesla@gmail.com or call 213.308.8954 8am-10pm Pacific standard time, M-F, 10am-10pm PST Sat and Sun. (Holiday hours may vary.) No refund or exchanges will be given on classes that are cancelled less than 48 hours prior to the class. WHAT IF radical cooks NEEDs TO CANCEL? Radical Cooks reserves the right to cancel any class that fails to attract requisite minimum enrollment or for chef illness. We will contact you by email or telephone and issue a full refund or you may request to be transferred to another class of your choice (depending on availability). Just ask! Email or call and we will happily do our best to answer any questions you may have. Thank you for choosing Radical Cooks!